Taskworks is Australia’s first 100% hands-on educational activity center for Primary school (Prep – Grade 6) and Secondary school (Years 7 & 8) students. It is unique in that students are immersed in activities that challenge their body and mind for the duration of their stay. It is open exclusively to schools Mon – Fri for school excursions. When visiting Taskworks the children will be divided into small groups and rotated throughout the facility for the duration of their stay. They will experience all the activities and given that each activity requires a combination of different skills, each child is sure to find an activity they thoroughly enjoy. Skills encouraged in current teaching and learning programs, which prepare students for success in education, work and life. 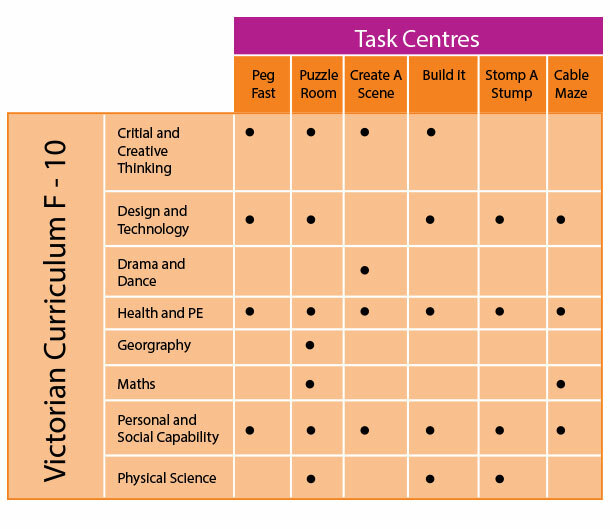 The following table illustrates the relationship between the activities at Taskworks and the Victorian Curriculum (F-10). The following schedule is the general format for day excursions. We do however tailor excursions to suit individual school needs. Eg. ½ day excursions, different start/finish times, etc. 10.00 - 10.15am Arrive at Taskworks. Explain to students how the day will run. Generally we accommodate 2-4 classes (40-100+ students) for both Primary and Secondary school students for full day excursions. Half-day excursions generally operate for smaller numbers (20-50 students), however a minimum of 3 hours is advised to enable students to experience the range of activities at Taskworks. Note: Schools have exclusive use of the facility when they visit. Minimum charges do apply for all group bookings. Our professional staff guide the children through the activities, giving simple instructions at the start of each task. Teachers and parents are encouraged to assist the children in their activities. All activities are indoors (the perfect summer or winter excursion) and school exclusivity creates a safe environment for your students. We provide an eating area for students. Snack food and drink is available for purchase, however students are required to bring their own healthy lunch (sandwiches, fruit, etc). There is parking on-site for 2 large buses. Day or evening graduations are available Monday to Saturday. To find out more download the attached pdf document.